'Tihei mauri ora!' 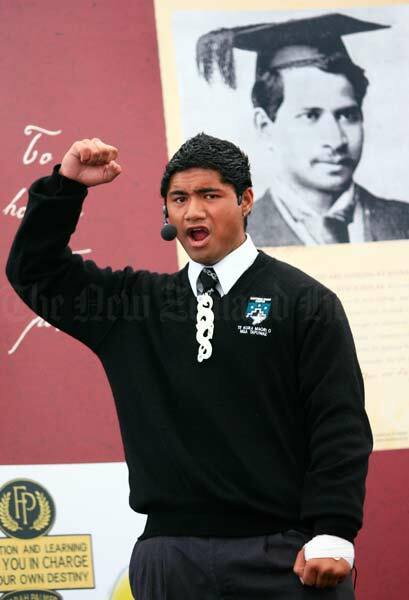 Thomas Mason, 17, delivers his whaikōrero (oration) in the Auckland regional finals of the Ngā Manu Kōrero speech competition, held at Hoani Waititi marae, west Auckland, in 2007. Thomas, a student at Te Kura Māori o Ngā Tapuwae College in Māngere, South Auckland, won the senior Māori-language section of the competition and went on to represent his region at the national competition that year. Behind him is the graduation photo of Āpirana Ngata, the East Coast leader who encouraged young Māori to excel in both the Māori and Pākehā worlds. In 2017 Te Kura Māori o Ngā Tapuwae accepts students from years zero to 13.